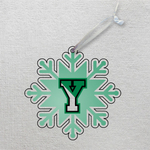 York College of Pennsylvania holiday ornaments to brighten the holiday season. Pick up this cool ornament to help us celebrate our 50th anniversary. Ornament etched snowflake with split Y design. 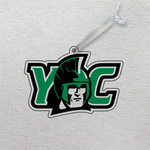 Legacy's flat teardrop ornament features the York College Spartan logo. 3D glass Christmas present ornament. Classic plastic ornament with string. The ornament is 3" x 3" and decorated on one side. Celebrate the holidays with this cute little reindeer ornament.